Michael Van Gerwen and Phil Taylor will go face to face in the final of the BetVictor World Matchplay at the Winter Gardens. Who will seal a the title in Blackpool? This article contains our MICHAEL VAN GERWEN vs. PHIL TAYLOR betting preview with match tips, free predictions, best odds, betting promotions and no deposit free bets! Phil Taylor turned back the clock to dismantle back-to-back World Champion Gary Anderson 17-8 in the semifinal averaging 101.63. He also landed nine maximums and finished with an impressive 49 per cent on the doubles. The Stoke-on-Trent ace was pushed all the way by Robbie Green in the 1st round before coming past Mensur Suljovic in the 2nd round. Mervyn King took Taylor the distance in the quarter final. Reigning champion MVG has dropped just 12 legs en route to the penultimate round in his bid to add a 12th tournament victory of 2016. Lewis finds himself on the brink of a second World Matchplay final, but enters the clash with a tournament average eleven points lower than his Dutch rival. These two have met 10 times in 2016 so far with van Gerwen winning on seven occasions to Taylor’s two. 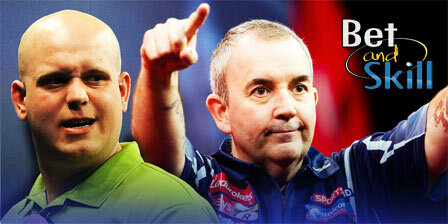 In 52 meetings between the pair, Phil Taylor leads 28-22 with two draws. The Power defeated Van Gerwen 18-9 in the 2014 World Matchplay final to pick up his 15th title in Blackpool, but has not won a major TV title since. He lost the Grand Slam of Darts final 16-13 in November, with the world No 1 always looking in control throughout the contest. £5 free bet with no deposit required for UK customers! "Van Gerwen v Phil Taylor predictions, betting tips, odds and free bets (World Matchplay Final - 24.7.2016)"